A two-part article in the Winter and Spring 2019 issues of The American Fly Fisher, the journal of the American Museum of Fly Fishing, explores the world’s oldest known artificial flies. The patterns date from the late 1700s and early 1800s and are part of the Harris Collection of Irish and English fly patterns at AMFF. 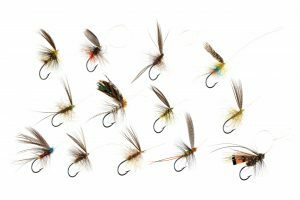 A rare look back more than two centuries to the fly-tying savvy revealed by the extraordinary Harris Collection of Irish and English fly patterns at the American Museum of Fly Fishing. The American Fly Fisher, the journal of the American Museum of Fly Fishing, has published a thorough analysis of the world’s oldest known artificial flies, dating from the late 1700s and early 1800s. Written by Andrew Herd and Paul Schullery, the two-part article appears in the Winter and Spring 2019 issues of the journal. The articles are generously illustrated with scans of the earliest known woodcuts and engravings of flies that appeared in fishing books in the 1600s and 1700s, as well as with a wealth of spectacular color photographs of painstakingly accurate replicas of the original flies tied by Australian master fly tier Robert Frandsen. The flies were originally gathered, used, and carefully documented by the Gregory family of Galway, whose colorful and often quirky history is also chronicled in the articles. The flies eventually came into the hands of Irish fly-fishing writer John Richard Harris, a fellow of the Royal Entomological Society and author of the milestone An Angler’s Entomology (1952), which featured among its many illustrations a photograph of a few of these very flies. The flies eventually made their way into the hands of Dorothy Downs (of Branford, CT), who generously donation them to the museum in 1991. The American Museum of Fly Fishing was founded in 1968 by a group of passionate anglers who wanted to ensure that the history of fly fishing was preserved as an important part of America’s culture, industry, and history. Having just celebrated its fiftieth anniversary, staff has energetically collected, studied, preserved, and exhibited the sport’s greatest treasures, including flies by countless historical and modern authorities ranging from Theodore Gordon and Mary Orvis Marbury to Lefty Kreh and Ernest Schwiebert. The American Museum of Fly Fishing is open from 10:00 a.m.to 4:00 p.m. Tuesday through Sunday from May through October, and Tuesday through Saturday from November through June. For more information about the museum, please visit amff.org or connect on Facebook, Instagram, and Twitter.